I read this article and found it very interesting, thought it might be something for you. The article is called Super Salad – Navy Apple Basil and is located at http://www.gardendish.com/super-salad-navy-apple-basil/. This Super Salad, with the flavors and textures of navy beans, sweet apple, and fresh basil, isn’t just a collection of leafy greens – it’s a meal! It’s a big, bountiful, satisfying meal that brings the spectrum of whole, plant-based foods to your plate in one, appetizingly beautiful dish. We’re talking legumes, whole grains, fruit, vegetables, and finally, lettuce. That’s why we call it a Super Salad. It’s so flavorful that we often eat it as is, no dressing. But of course, feel free to toss it gently with a drizzle of your favorite oil-free dressing, if you like. This is a favorite dish to take to parties. You’ll have a healthy and satisfying meal no matter what anyone else brings, others will appreciate this healthy option as a side, and your host will appreciate such a lovely, colorful display for the table. 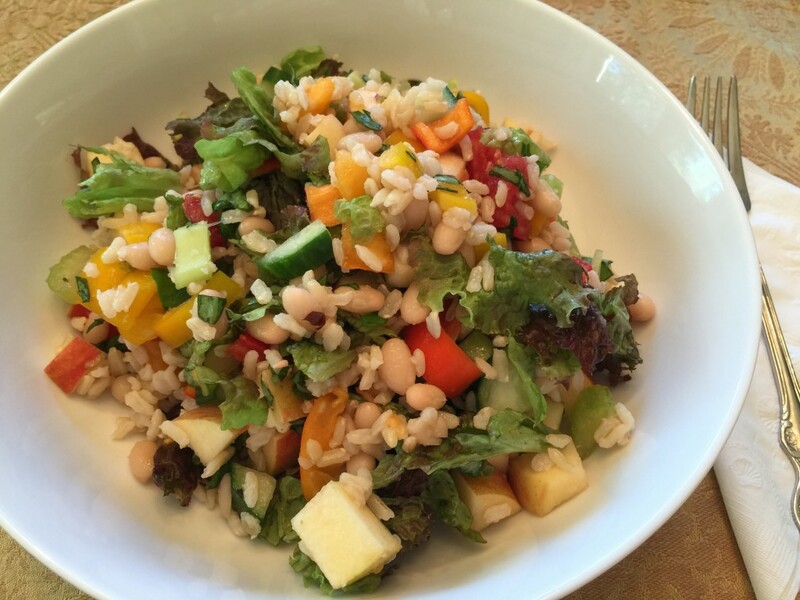 Navy beans, apples, and fresh basil is one of our favorite flavor combinations for the Super Salad. 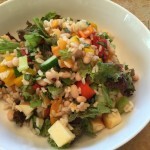 Try your own combinations, and make your own signature Super Salads. In a large mixing bowl, gently toss together all of the ingredients. Enjoy with, or without, your favorite salad dressing. If you don't eat it all in one sitting, it will keep very well in the refrigerator for a couple of days. Lay a paper towel on the surface of the salad, cover the bowl with plastic wrap or a tight-fitting lid, and refrigerate. We were surprised the first time we did this, how fresh it still looked and tasted over the next two days. Nutrition (per serving): 464 calories, 76% calories from carbohydrates, 16% calories from protein, 8% calories from fat, 17 g fiber.